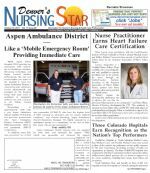 Published weekly, Denver's Nursing Star was established in 2003 and is broadcast to RNs, LPNs and other healthcare professionals every week. With more than 9,525 e-publication readers and 120,000 monthly visitors to our Web site, Denver's Nursing Star is the largest health care newspaper in Colorado. Our print and online edition has a readership of 20,000+ and is distributed monthly to healthcare facilities throughout the Denver Metro area and direct mailed to RNs, LPNs, students and faculty at college and universities throughout the state. If you have a news idea, press release, announcements or personnel changes that affect the industry - call 720-283-2209 or email news@denvernursingstar.com. RECRUITERS: Ask about our advertising opportunities - JOB ALERTS (Immediate broadcast/Immediate results) - RECRUITER SPOTLIGHTS - RECRUITER SHOWCASE - PRINTABLE PDF. ADVERTISING - BANNER ADS AND ONLINE RATES AVAILABLE. To request rates and information email info@denvernursingstar.com . COPYRIGHT © 2008 METRO PUBLISHING L.L.C. ALL RIGHTS RESERVED This www.denvernursingstar.com website is owned and operated by METRO PUBLISHING L.L.C. and contains material that is protected by international copyright, trademark and other intellectual property laws and unless otherwise specified, is intended for your personal, noncommercial use only. Images and information contained on this site may not be modified, copied, reproduced, republished, uploaded, posted, transmitted or distributed for commercial use in any way unless authorized by the publisher or editor of Denver's Nursing Star. You may download material from this site and may use this site for personal and non-commercial use, provided all copyright and other proprietary notices remain intact. To request authorization for commercial use or reproduction of any material on this site email info@denvernursingstar.com or call 720-283-2209. The Emergency Nurses Association (ENA) announced the 2011 inductees to the Academy of Emergency Nursing (AEN). The AEN fellowship is a prestigious honor recognizing emergency nurses for their contributions to patient care in and out of the emergency department. "Induction into the Academy of Emergency Nursing is one of the highest honors the profession bestows," said AnnMarie Papa, president of the Emergency Nurses Association. Porter Adventist Hospital and the Porter Heart Institute now offer the latest in angiography capabilities, while combining diagnosis and treatment in a single procedure. With the installation of the new Artis zeego® multi-axis angiography system from Siemens Healthcare, patients can safely be treated using a less-invasive approach. Porter is Colorado’s first hospital to install the system. The St. Joseph’s Hospital Foundation of the St. Joseph’s Breast Care Center will receive $1,000.00 as part of an innovative breast cancer awareness campaign from Massachusetts Mutual Life Insurance Company (MassMutual) in the name of Melissa Edelman of Wealth Concepts, LLC, a general agency of MassMutual. hile Aspen Valley Hospital (AVH) provides our community with state-of-the-art healthcare facilities, life-saving technology, and highly trained medical professionals, the care you receive before you arrive at the hospital is vital, too. Aspen Ambulance District, a community-wide ambulance service administered and managed by the hospital, brings that same level of excellence in emergency medical care and transport to all Pitkin County residents. Car Seats Colorado Dedicated to Keeping Kids Safe on Roadways.